In his feature directorial debut Charlie McDowell has taken a very intelligent, very inventive script from Justin Lader (who also makes his feature screenwriting debut here) and makes the final product all the more engaging with his talented cast and visual trickery. It's not that this isn't anything we haven't seen before, we understand how certain elements of the story are achieved visually, but that the film makes the impact of what we see more important by what it implies rather than the fact it is simply "neat" is refreshing. Much of The One I Love is about implications though and in being structured around such things one may think it will leave you with a yearning for more concrete conclusions, but in all likelihood you'll be satisfied by the exploration taking place. The exploration is that of the most universal emotion in our world-love. At this point, between the music we hear, the movies we watch, the books we read and not to mention the surplus of information we now receive about the lives of those around us thanks to social media one would think we'd be tired of talking about and dealing with the downsides of love, but somehow McDowell and Lader have managed to bring an interesting, insightful look at the word, the emotion and what it means when it's put into action. They take the idea of the thought of love and all its flourishes as so much more attractive than the reality of being someones companion that they make it unattractive in the sense that maybe it isn't for all of us. Why has the human race become so enamored with the thought of legal companionship, of narrowing it all down to being with one other person and allowing that to sum up our time spent here on earth? It seems an unnecessary question given the constructs of our society, but really, why? Reproduction maybe? So many people have kids out of wedlock these days it almost isn't a justifiable reason and yet love is still the one thing everyone chases after in hopes that it will one day bring about the peace and happiness we are all instilled to believe we are destined for as children. I don't know that we should all denounce the quest for love, it seems to have worked well for myself and many of those around me, but that The One I Love hooked me into thinking about the pros and cons of a single emotion and all it triggers is a sign of genuine intrigue. 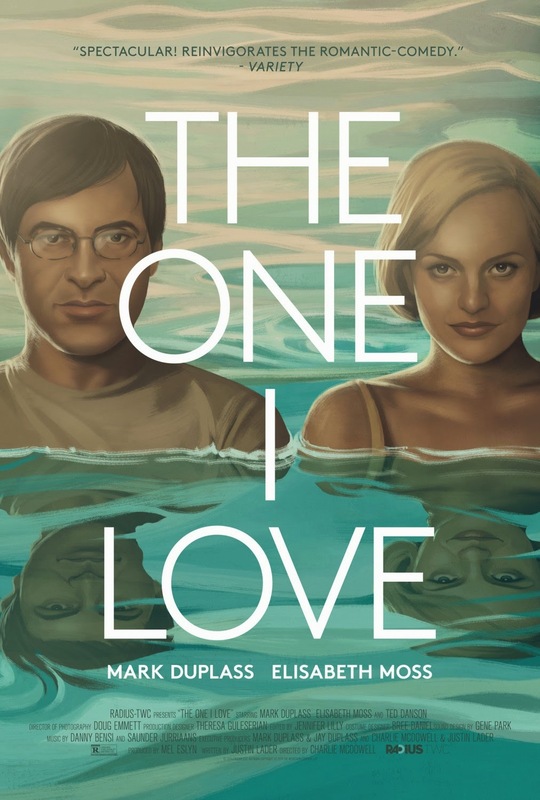 We are introduced to Ethan (Mark Duplass) and Sophie (Elisabeth Moss) as they divulge the hardships their relationship has encountered as of late to their therapist (Ted Danson). They have long since lost the spark their relationship once had, the freshness of the affair has faded and the two have yet to adjust to the changes all relationships must encounter and adapt to. It isn't without trying that Ethan and Sophie have not rekindled their original spark as they desperately grasp at nostalgia and memory by recreating the spontaneity of the first night they met. Naturally, what is forced cannot feel organic but rather their marriage has become strained to the point they feel they are ready to break. Under such dire circumstances their therapist recommends they take a weekend vacation to a place of serene quiet and tranquil exclusivity. Both parties seem willing to do whatever it might take to rekindle that spark of romance, though Ethan seems more hard pressed to win over Sophie than Sophie even seems motivated to re-capture what is already lost. The hook of the film though, the strange occurrences that illustrate the tool in which to convey the main ideas, come into play once the couple reaches their vacation spot and they both literally and figuratively find themselves. It is somewhat impossible to go on talking about this film without digging into the details of the plot, so fair warning. Once Ethan and Sophie arrive at their vacation destination they discover a guest house with an appealing yet perfectly strange piece of magic. When only one of them enters they find what seems to be an exact copy of their partner, only this copy possesses the ideal characteristics and physical attributes they desire in one another. You can imagine the conflicts that unspool from here whether it be questions of if being with the copy is actually cheating or whether the copy is in fact better than their original partner despite essentially being the same person. In short, many a can of worms is opened. What is so interesting about this set-up though is the countless number of questions the scenario poses. It is, on the surface, a romantic comedy that can be taken lightly as a couple discovering what they loved so much about one another when they first met and getting back to that place where they made one another truly happy, but on the darker side of the coin is the idea that people change as they grow and don't always become the person we expected or wanted them to be. It is clear from the beginning that the marriage has become something Sophie likely never wanted or never imagined she'd be a part of and much of that is due to the fact she doesn't recognize the person Ethan has become as the man she fell in love with. Even that description sounds cliche in a way that the film is not though as it's more about growing into a relationship than saving one. There is no denying the film is a bit of a weird head trip, but Duplass and Moss sell it with ease and earnestness. The subtle changes in their appearance to help us differentiate between the originals and the copies is so precise in the goal it means to achieve it is instantly recognizable thus hilarious. Their initial reactions are natural in that they are freaked out, but ultimately allow the curiosity to win out, which is of course good for the audience given we want to know what will happen to them and what is actually going on. This is where the film runs into its major issue. We accept the fact that the situation presented to us is happening with no problems and are more than willing to go with it because of the questions it raises and the intimate character study the film ultimately purports, but when the attempt is made to give some kind of reason behind the "how" of the situation there is too little information provided ultimately adding more confusion to the scenario and dissatisfying the viewer. From the moment we catch a glimpse of a computer and files that exist on it through to the end of the film I was wondering if I missed something or didn't understand because the execution of any type of explanation is so muddled it is lost in the tension of the situation we actually care about: which version of Ethan and Sophie will escape this prison of a vacation house? The logic doesn't always make sense and the rules aren't exactly explained so that we understand what can and what is happening, but Lader started out so strongly and delivers on so many other levels it is easy to forgive his missteps with the two leads completely selling it to the point we simply understand it is best to draw your own conclusions and relate to it on a personal level making the film all the more affecting.